A tired tabletop is one way to send all your guests into a surefire snooze. Sure, everyone’s really there for the food, but if the dining table doesn’t back the evening’s fabulous meal, your fellow dinner companions may quickly grow bored—no matter how good your cooking is. Want to infuse a little life to your dining room? In lieu of a traditional holiday setting, this season, we’re loading up on alternative patterns and unexpected colors that stray far from your standard display. For all our maximalist entertaining needs, we asked the team at David Stark Design and Production for their most inspired and color-charged ideas for the dinner table. Reinventing six different colorways, the renowned event producer and decorator extraordinaire shares his rules for crafting a layered and cohesive tablescape. Take a look. Not unlike putting together a wardrobe, Stark approaches table design from a layered perspective. His advice? Think of your table linens as the outfit, or defining base for your composition, and the glasses, napkins, and centerpiece as your accessories. 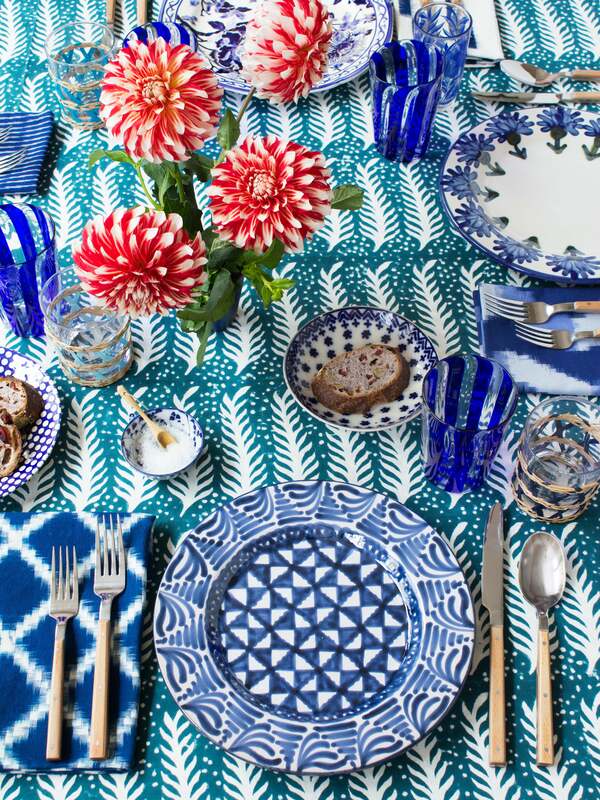 “Often, the tablecloth becomes the linchpin of our color story, creating the canvas for a tablescape’s palette,” shares Stark. Echoing the concentric circles of Pierre Frey’s multi-colored “Mil Neuf Cent Vingt” fabric, here, Stark and his team incorporated plates and glasses that subtly mimic the existing forms. When designing around a powerful range of rainbow-bright hues, repetition will tie the varied palette together. Putting a contemporary spin on a timeless color pairing, Stark and his team revamped this classic color scheme by introducing graphic movement and woven textures into the picture. From the tablecloth to the napkins, each piece plays with this iconic marriage in a shapely way, while natural details extend a sense of softness to the abrupt contrast. Be it a lavish peach or rusty apricot, of all the colors we’re craving right now, orange comes in at the top of our list. Love the look of a striking, monochrome set up? When working pattern into an already strong color scheme, be sure to pay attention to proportions. Speaking of scale, the same principle applies when introducing high-impact motifs to the scene. If there’s a wild print you really love, don’t be afraid to bring it to the table—just do it in smaller doses. When scaled down to its smallest size, a heavy print will take on the form of a neutral base. Table florals aren’t there just to look pretty. In fact, depending on their color, texture, and movement, fresh florals can add a sense of visual intrigue and build on the depth you’ve been working to create. While certain prints can get a bad rap, don’t write off any “dated” patterns just yet. Take plaid, for instance. When complemented by a range of casual shapes and marbleized waves, the straightforward print takes on fresh meaning. “Plaid has certain connotations—school uniform, lumberjack, even Scottish Highlands—but it can also feel less rigid when paired with the flowing forms of marble, batik, and other materials that either show the heartbeat of the artists’ hand or the natural imperfections of organic elements,” suggests Stark. Want more table decor ideas?